But rather a gaggle of these adorably gawky maize-colored babies, crossing to the lake with their mom. I had a strong physical impulse to pull over and pet them but a) there is no good shoulder for pulling over safely and b) the woman directly behind me [read: Might as well have been in my backseat yelling "DRIVE FASTER ON THIS DANGEROUSLY CURVY BACK ROAD!"] would have crashed into me and probably wiped out the little family of geese, too. All badness. Surely resulting in worse karma than me not putting a quarter in the newspaper box. I think I like the little goslings in photo number two better. What's up with that? Am I losing my mojo or are those little birds that cute? Also, just today someone told me that Ryan Gosling is brilliant in the film Lars and the Real Girl. Have you seen it? I plan to check it out. While the goslings are cute, the gosling is hot. 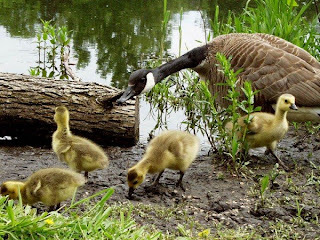 Besides all that, I am pretty sure that had you stopped to pick up one of those cute little things, that mama goose would have pecked your eyeballs out. I second the lars and the real girl nom...it was funny. Yesterday I witnessed a 3-car fender-bender all due to two guys tailgating. That said, when I was in traffic safety school last week, we were told of a woman who stopped on a fairly busy road b/c a momma duck was crossing with her ducklings. It caused a chain reaction crash in which one person died. So the question was posed : what would you do? If it were me, I'd STILL stop for the ducks. Too bad for the dopey tailgaters going too fast. Well, unless a semi was tailgating me...then it'd be pate on the roadway for sure! yummmmmmm...could eat him up with a spoon!! My sister once saw Ryan Gosling in Beverly Hills. She walked very quickly to keep up with him. Stalking / jogging let's not split hairs. All of the goslings featured have the same coif.